Electricity is the most widely used form of energy. Electricity run our fridges, washing machines and in general, all electrical appliances in the kitchen. Electricity will probably power all future cars’ motor. In order to produce electricity you need another form of energy such as mechanical energy, solar energy, wind energy and so on. The day I met electricity. When electrons build up on an object, the object becomes charged with static electricity until the electrons are able to jump to another object placed nearby. 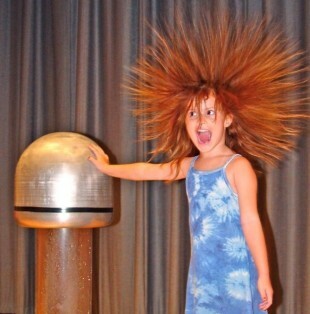 The object that is charged with static electricity could be a car, a ruler, or even a human body. Any object that can conduct electricity can become charged in this way. To understand static electricity, we have to know the atom, how big it is and its structure. In other words, what is all the stuff around us made of?. There are 115 kinds of atoms and all of them are different from each other. Some are small, others are bigger. All of them are made up of a “nucleus” situated in the middle of each atom. The nucleus contains two important kinds of tiny particles, called protons and neutrons. Orbiting around the nucleus are smaller particles called electrons. The 115 types of atoms are all different from each other because they have different numbers of neutrons, protons and electrons. Have a look at the atom structure. Can you see some electrons living the nucleus? Why? Electrons orbit in the space surrounding the nucleus. Electrons are attracted to the protons and repelled by other electrons. These forces of attraction and repulsion are much stronger than gravitational forces and are called electrostatic forces. The electrons are said to be negatively charged and the protons positively charged. In conductive materials, such as metals, the outermost electron in the atom is basically free, so it is very easy for it to leave the atom and move around in the space between the atoms. Conductors are made up of atoms whose electrons ( conduction band) are able to escape from the atom’s influence. In a metal, some electrons are not stuck (fixed) to any particular atom and are free to wander in the metal. For instance, the copper, the most used conductor in the world, there is usually a free electron from every copper atom. As the electrons move, they collide with the atoms and thus meet resistance to their motion. The greater the number of collisions the greater the resistance. Tap Water, Animals, Trees ..
On the other hand, in Insulator materials, such as glass, the outermost electron in the atom is tightly bonded to the nucleus by a electrostatic force. In this case, most electrons are attached to particular atoms. Almost none are free to wander through the material, and this prevent the flow of electricity.